This international, fraternal and benevolent organization is for Roman Catholic men. 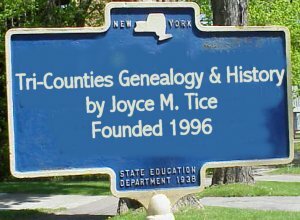 It was founded in New Haven in 1882. Because of the consistent opposition of the Popes against secret societies, Catholic men were unable to join the fraternal organizations popular in the late 1800s and early 1900s. The objective of this organization was originally to give "mutual aid and assistance to its members and their families." Unlike many other of the fraternal organizations, it has not declined in membership having 1,235,000 members in 1978. Membership is limited to males over eighteen. 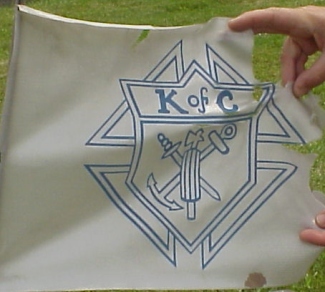 For those younger than that the KC sponsors Columbian Squires. 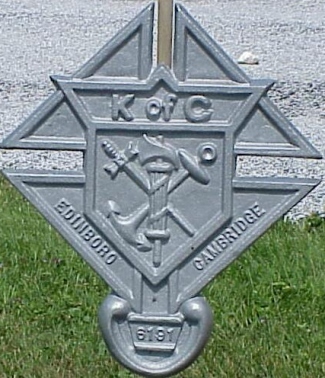 The K of C excludes women, but not non-Caucasians as many other fraternal organizations do. 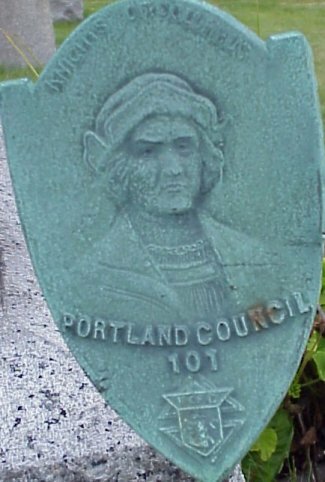 There is no associated women's group, but Daughters of Isabella has sometimes been considered one. Following the example of Freemasonry, which set the example for most fraternal orders, it has degree rituals, signs and passwords but no oath of secrecy. Members are asked to keep the ritual secrets, but to conform to the opposition of a long series of Popes to secret societies, no oath is required. 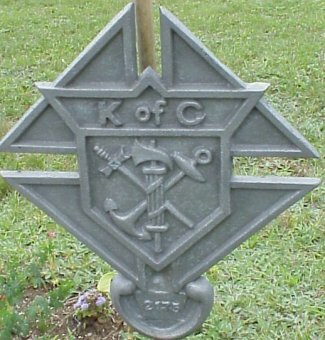 The motto of the K of C is "Charity, Unity, Fraternity, Patriotism." 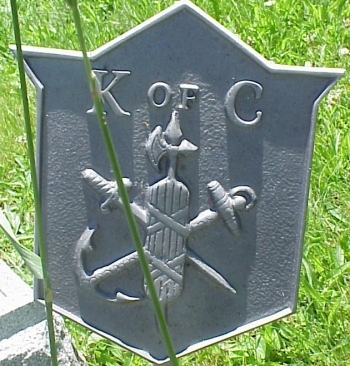 Of the symbols in its insignia the anchor refers to Columbus sailing the seas, while the sword, axe and armor refer to the elements of knighthood. 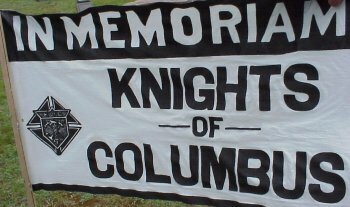 The letters TFMM are actually the initials of the Latin watchwords of the Knights of Columbus. You'll find them on the backs of old K. of C. watch fobs. I'd tell you what they are, but than I'd be violating my pledge of secrecy! All kidding aside, I'm a fraternal orders historian and a frequent contributor to the Masonic Museum's site. Check it out at www.phoenixmasonry.org. They have an excellent selection of information on the different orders. I've contributed histories of the Catholic, Jewish, and temperance orders on the site. 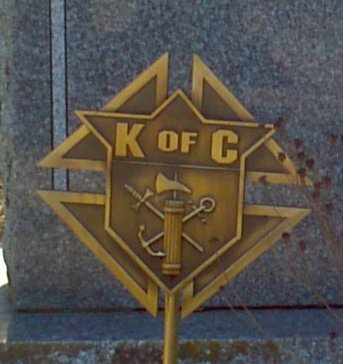 The Knights of Columbus letters Stand for TEMPUS FUGET MEMENTO MORI. Time Flies; Remember [that you] Will Die. I suppose It could br translated as "remember death". March 2007 -- The F.T.M.M. 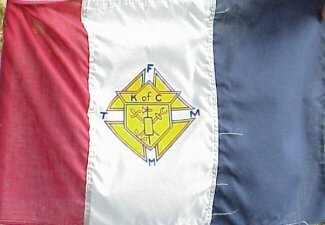 insignia you asked about on the Knights of Columbus Flag actually is T.F.M.M. Have you ever seen one ?